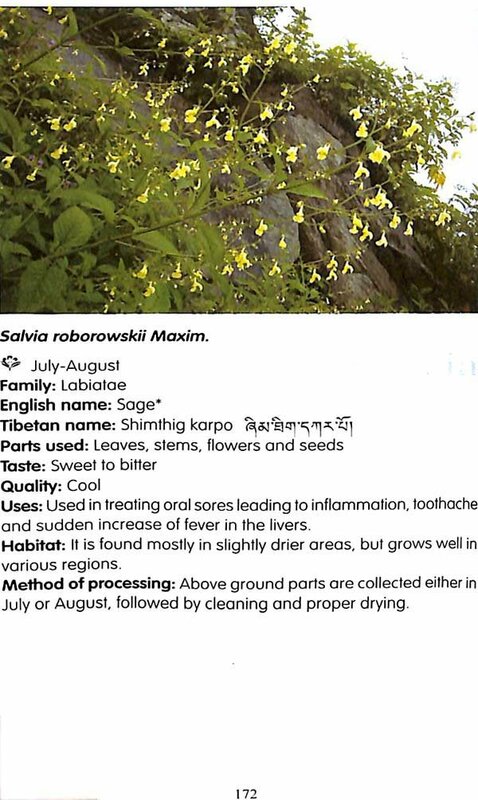 This book, prepared by Dr.Tsering Dekhang of the Tibetan Medical and Astrological institute, contains through descriptions of about 200 medicinal plants employed in the Tibetan medical system. 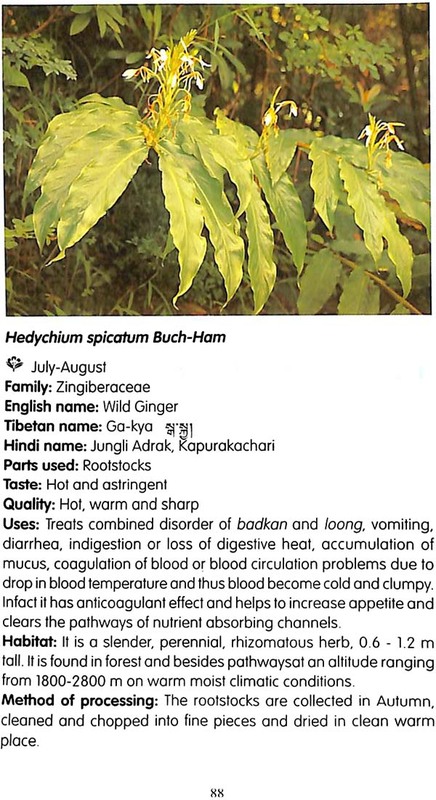 It includes herbs, shrubs and trees that thrive primarily in the Himalayan region, as well as other parts of the world. 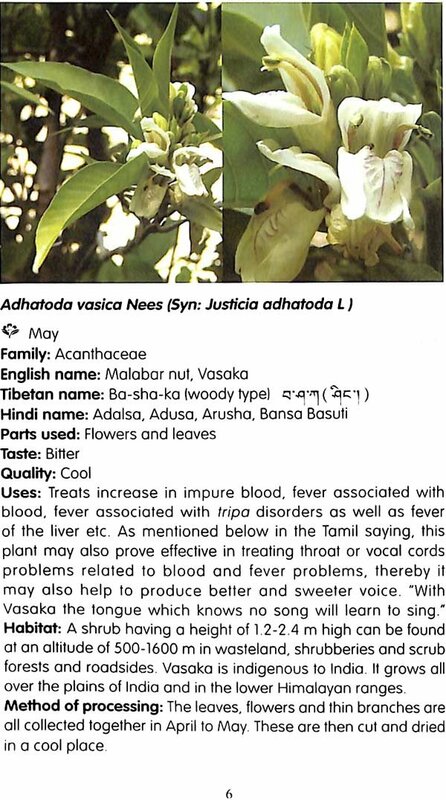 I have no doubt that this book will be valuable resource for students, researchers, scholars and medical professionals interested in medicinal plants and their use in treating disease. Given the interdependence of the world in which we live, sharing knowledge is an important way of contributing to the welfare of human beings in general. The author is a qualified practitioner of Tibetan medicine, which is one of the greatest legacies of Tibetan Buddhist civilization. It is a system that can contribute substantially to maintaining healthy mind and a healthy body, viewing health holistically as a question of balance. This natural balance can be disturbed by a variety of circumstances such as diet, lifestyle, as well as seasonal and mental conditions, which gives rise to different kinds of disorders. As an integrated system of health care Tibetan medicine has served the Tibetan people well for many centuries and I believe can still provide much benefit to humanity at large. This book will provide readers with some insight into an important aspect of the tradition, the use of medicinal plants. 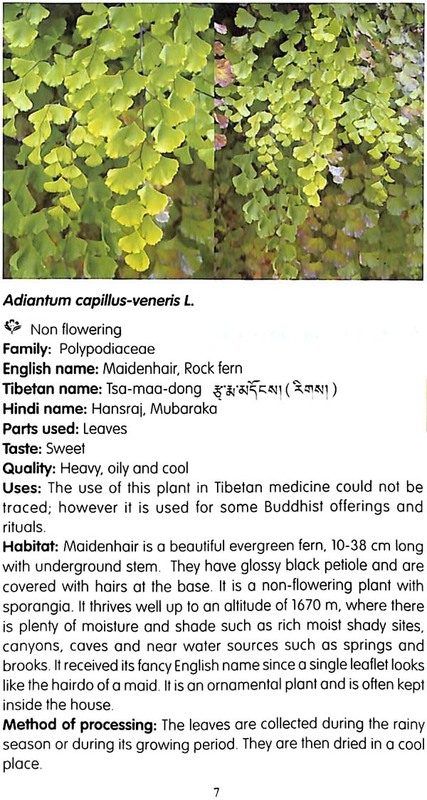 This book contains the description of nearly 200 Tibetan medicinal plants, including herbs, shrubs and trees. These plants thrive in the picturesque Kangra valley against the backdrop of majestic Dhauladhar Mountain Range in the state of Himachal Pradesh, India. Many of the plants I have mentioned herein grow well in all the foothills of the Himalayas as well as in various parts of the world. The medicinal plants may vary slightly in their qualities from place to place, but their therapeutic uses are similar. This book is based mainly on the authentic Tibetan medical texts; Duetse-men-ghee-trungpae-lekshad-norbue-frenzae by karma Choephel and the other text; Shelgon-Sheltreng (Compact Crystal Rosary)by the well-known eighteenth century Tibetan doctor and scholar Deumar Tenzin Phunstok. It is considered the most outstanding contribution in the field of Tibetan material medica. Previously in Tibet, documentation of the therapeutic values of plants was based on the insight and observation of past scholars. One interesting observation is that some knowledge about the uses of plants was gained through the behaviour of animals. For example, Tibetan doctors adopted remedies for fractured bones by observing the behaviour of birds searching for plants that would prevent egg shells from cracking. 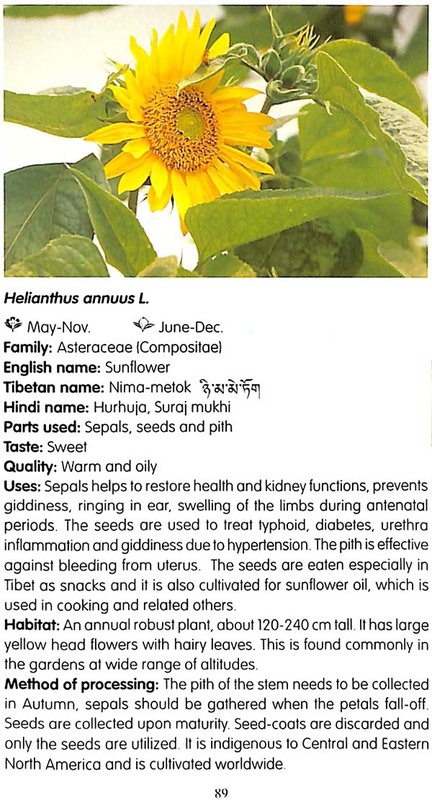 According to historical records, the use of plants in Tibetan medicine existed in Tibet from the time of enthronement of the first king of Tibet, Nyatri Tsenpo (127 B.C). 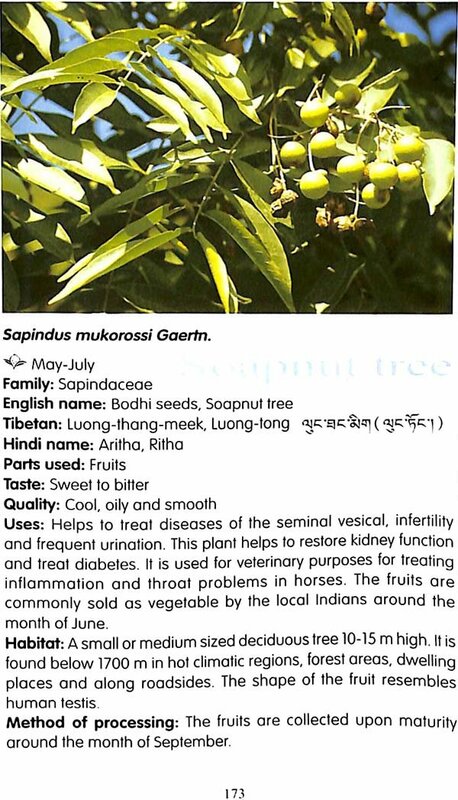 Thus the knowledge of medicinal plants was passed on from generation to generation in a continuous tradition. These days many scholars acknowledge and appreciate the contribution of traditional Tibetan medicine for the treatment of various chronic and modern ailments worldwide. Interested people, including those from the scientific community, are eager to learn about and explore the special features Tibetan medical system holds in store to promote the health and well- being of people around the world. Two principle factors behind this success are the curative properties of the plants themselves and the sophisticated ways in which they are blended into effective remedies with the holistic approach to the treatment of diseases. 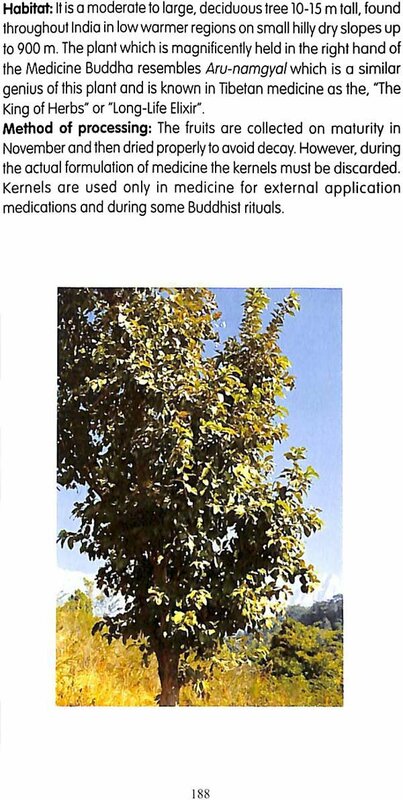 Firsthand documentation and thoroughly researched books on medicinal plants by Tibetan physicians are quite rate. 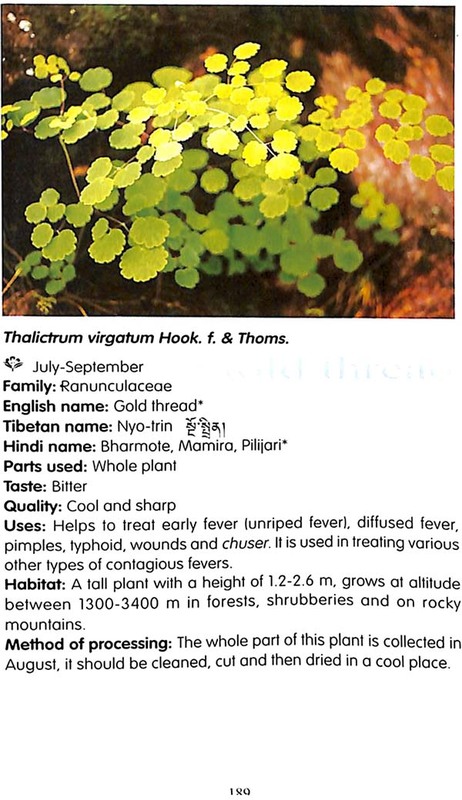 Thus, I have taken on the challenge and responsibility of documenting and presenting in this book many medicinal plants found in the Himalayan foothills. I was able to click beautiful pictures of the plants during my numerous field trips to the mountains and plains of India. I hope that this handbook will serve the need of both professionals and amateurs in their quest to know more about medicinal plants. While holding responsibility for any errors and limitation in this book, I welcome any corrections and suggestions from the readers.